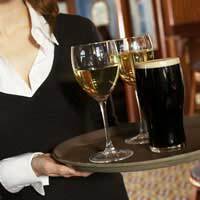 Many people work within the hospitality industry in jobs such as bartending or waiting-on in restaurants and although their basic hourly wage is often set at minimum wage, they can often double their income and earn even more than double as a result of the tips or 'gratuities' they receive from customers. Tips are given voluntarily by customers to staff as a reward for the service they've received. This amount is discretionary here in the UK and not compulsory, unlike some other countries where, though also not compulsory, a certain percentage of the overall bill is usually added and left as a tip if the service has been good. Tips are usually administered in one of two ways. The proprietor of the hotel, bar, pub or restaurant will either allow staff to collect tips individually or they'll be collected in what's known as a 'tronc'. This term derives from the French meaning 'collection box' often referred to in the UK as the 'tip jug'. In this scenario, the tips might have been intended for a specific individual but they will be required to place any tips in the tronc to be distributed amongst the staff at a later time. The tronc will be run by a member of staff (troncmaster) who is acting independently of the employer. If the company uses a tronc, it's for the troncmaster (who cannot be the employer or a director of the company) to stipulate how the tips are divided up. If the employer does not have any say on how the tips are shared out, then the tips are not subject to National Insurance (NI) contributions although they are still legally liable for tax which should be paid via the troncmaster if he/she is responsible for dividing and sharing the tips. Service charges, on the other hand, are compulsory additions to the price charged for a service and, in the hospitality industry, they are usually between 10% and 15% of the total cost of the bill. These are collected by the employer and, if shared amongst the employees via the payroll, they are subject to both tax and NI. Many employers and employees are often guilty of 'overlooking' tips and gratuities when it comes to tax and NI and employees in particular often mistakenly view tips as a 'cash in hand bonus' to their wages. However, it's important to state that ignorance is no escape from the law and mistakes relating to this area can be very costly to an employer if investigated by HMRC and found to be a contravention of the law. The key things to remember are that income tax is due on all tips, no matter how they are given. If tips are offered in cash from the customer directly to the employee, then the employee should declare them for tax purposes. If the tips come by way of being added to a bill paid for by credit card, then it's the employer's duty to declare them for tax. If any tronc has not been formally registered with the Inland Revenue, then the business is responsible for deducting the tax and if it doesn't want to be liable for NI contributions too, it must ensure that it has no influence on the way by which the tips are divided. This can be done by holding a written record signed by the staff outlining how they themselves have decided to divide the tips. The HMRC has recently revised its guidelines on tips and troncs and more detailed information can be found on its website or by obtaining the leaflet E24. Can i be held liable for buying on an account that we used for 2 years and employer said stop, buy cash somewhere else but there was never enough cash so in the interest of the restaurant i bought from that supplier on account. I have been working as a K/Porter for the last few years and when I started all tips where shared equally, over the last few months it seems like the head chef gives us a minimum and he pockets the rest , this could be in excess of hundreds is he legally to do this as there was no consultation. I have just started a new job (chef) and part of the reason I took the job on a lower wage was due to being promised tips (monthly). I have found out that because somebody has broken a printer on the bar that our wages are being spent on a new printer. Is that legal? Firstly I don't work near a printer, secondly I wasn't even employed then, thirdly should it not be declared 'wear and tear'? It is a brewery ran pub and not fully independent so surely that should cover costs? What are the laws on deductions for broken equiptment. I've looked on ACAS and other websites and assuming that even though customers pay workers for their service, employers can just do what they want anyways? Renders the whole tips scheme useless. We have a tronc, but he's the GM and he says its going towards the printer. My 17yo son is working as a waiter for a large hotel chain, and has been told that he will only be offered breakfast or lunch shifts, and therefore he is not entitled to a share of tips. Is this correct? I have been working in a cafe run by the large national charity. We have been told that we are not allowed to accept any tips and instead must put any tips given into a charity donations box. Can our employers legally do this? All workers should be fully informed on the distribution and breakdown of service charges, tips, gratuities and cover charges and the level and purpose of any deductions. Business should seek to reach agreement with workers on any change of policy. Therefore, you would have to ask your employer what the company policy is. You can see more via the link here , if you wish to find out what the code of best practice is. You would have to speak to your line manager directly regarding this matter. As tips are unregulated payments, there are no specific rules about their distribution, please see link here. I am 17 and work in a bar waitressing and washing up. I feel like the tips I earn get distributed unfairly since they are split between me, and the two owners (the chef and bartender). I would like to know if they legally have the right to do this. The government has a Code of Best Practice on tips that says how your employer should handle them. It’s voluntary - your employer doesn’t have to follow it - but if they do, they should have a policy on tips, please see gov.uk link here , for further information. I am working as a front desk operator in an organization.just set up 2 months ago. n when people give the tip amount in my hands after partying n sd this is for the staff members.bt all gt d tip bt I was sd that front desk does not gets any tip.is it true.or are they unfair to me. You would have to ask your employer what the company policy is and whether the tips are shared. There are no set rules regarding this matter. I am working as a front desk operator in an organization ..just set up 2 months ago.. n when people give the tip amount in my hands after partying n sd this is for the staff members..bt all gt d tip bt I was sd that front desk does not gets any tip..is it true..or are they unfair to me..
Hello, I’m working in a restaurant at the moment. I’m starting to feel terrible working there because of how they operate the tips. I’ve been working there for 3 months and I’ve had suspicions about the tipping system because I only ever get around £20-£30 during the week. I’ve just recently found out that my managers would count all the tips as a whole and then split them up to the staff according to how much hours they worked. That is what I’m worried about because the tips that I would get from customers during Friday and Saturday which is the busiest days would also be shared to the staff who weren’t even working at those days. I feel that it’s really unfair because some nights there’s just me and a manager working and it could get really busy so both of us would get a lot of tips from the customers but those tips will also be shared to everyone. Is there anything I could do about this? Legality wise? Plus these tips are not even recorded in our payslips which is even more worrying because there could be more tips going into someone else’s pocket. I can only direct you to the gov.uk link here for further information, as it is a tricky arena to give any set/concrete advice, as non exists. I've worked for pub serving food over a year we put all tips in jar that go upstairs not seen again. I believe should be shared equally to all staff working during food service. When asking about tips am told we use all years tips to go on staff Christmas meal. We did this only using 25%of our tips we now 6months into our 2nd year tips continue to build our employer even had cheek to say someone steal tip money during periods we are quite so obviously not collecting amounts that satisfy them. How much do they want just don't seem a fair way on staff. We just collecting money to pay for staff outing usually ends up all new starters benefiting from. So now I'm not happy to take tips from customers as not given to staff. Now Drinks have come issue having to record whom bought it on what day only have 7days to drink. Not be a drinker feel little over the top. So not only keep our tips keep our drinks too. Are managers of a hotel/resturant allowed the tips that the waitresses make? The manager's on a salary? They take the tips whenever the tills are down or when someone walks out of the resturant? I dont know the legal properties so please help! I work in a restaurant. Customers leave cash tips which is pooled between us. In February this year our tips were witheld due to new guidelines which says tips must now be taxed. 10 months on we have just been paid the tips through payroll. This now has to be declared to tax credits and affects how tax credits are paid for some employees. They have also stated that we won't be paid them again for another 12 months in a bid to stop us leaving. Is this legal? My employer makes us put all tips (whether in cash or on a card) through to the till so it shows up as income on the x readings at the end of the dayThe establishment is a cafe, restaurant, pub and inn so there are quite a few members of staff.We then, if we are lucky, receive an envelope containing our monthly tips but normally 1 to 2 months later.It seems to me that the chefs get a standard tip each month and the rest of us get random amounts I suppose based on how well we have done and how many hours we have worked.It all seems a bit dodgy to me!Obviously they are putting it all through as income on their books so it is liable for tax too.Is this all legal? @zoebird - I have managed several restaurants and tipping differs significantly across establishments i.e some restaurants allow their staff to keep all tips, some charge an admin charge for tips that have come via debit or credit cards and other owners such as yours keep the card-processed tips. I can only suggest you quietly tell your customers that if they tip on their card it goes to the restaurant and not the staff. Most diners are against this and will leave a tip in cash instead, many even ask directly. In addition to your questions, one of the reasons this remains such a grey area is that in practice, the tips that go to staff should be liable for tax via the HMRC. I work in a small, family run restaurant. Our cash tips are all pooled together and they are split between front of house staff and kitchen staff which we receive monthly. We don't have a service charge included in the bill, but customers usually leave 10%. Customers sometimes leave their tip on card as we have a separate gratuity option on the card machine. I started in February 2015 and have never once received card tips. The members of staff who have been working longer than me, said they were promised card tips at Christmas 2014. When I have text my manager regarding card tips, she has ignored me and has been very ominous about explaining to us when we will receive card tips, if we even will receive them? If they are using the card tips for expenses for business, should they be staying this in the initial contract? Same as if we are supposed to receive them, should that be stated in writing also? Surely it's misinforming to the customers if they believe their card tips are going to us? The manager has stated to another member of staff that tips on card take a long time to process, is this true? I want to hand in my notice fairly soon, but don't want to leave until I know what's happening with out card tips! Please help!